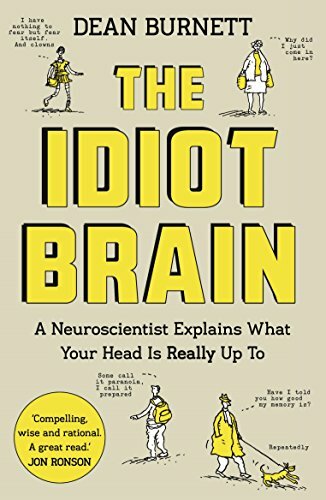 What happens when a neuroscientist/psychiatrist turned comedian writes a book about the brain and how it works? Well, in short, an immensely amusing book about neurology. Whether you are a teacher, philologist or a scientist in the lab, this is a readable book to everybody interested in finding out how the brain works. The author shows how our brain really reacts in different situations, sometimes in a very bizarre and peculiar way. He gives explanations to different mechanisms in a readable way. For example, he describes how our mind ‘messes with our memories, jumps at shadows, and convinces us we’re brilliant when we’re not’. Burnett describes how capable our mind is of working in extreme situations and, interestingly, how our brain is capable of getting us to do irrational things while actually working normally. The book is divided into chapters that describe different aspects of the brain – for example Fear: nothing to be scared of (The many ways in which the brain makes us constantly afraid) or Group hug! (How the brain is influenced by other people) etc. So, the subjects are quite varied, even though we are only talking about the brain. The fact that this is an immensely popular book is not a surprise. The book is funny, reader-friendly and a (surprisingly) easy read for non-neurologists like me. That being said, I wish he had provided more explanations for some phenomena. Nevertheless, even real neuro-scientists appreciate the amusing way facts are presented: after all, Dean Burnett has a PhD in the subject. Being a researcher in the medical field I might have been familiar with some concepts already, however it did make me laugh and shake my head in disbelief more than once. Definitely an unusual read, but well worth it.